Until a few years ago, whenever anyone asked me to pick an all-around favorite halibut-fishing technique, I would quickly respond that I like bouncing metal jigs along the bottom. Well, as I’ve gotten older and body parts have started breaking down more often, I’ve become much less a jigger and much more commonly a bait fisherman. In fact, I don’t think I’ve caught a halibut from Washington waters on a metal jig in the past three or four years, maybe longer. 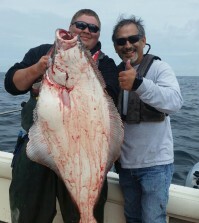 Let’s face it, fishing halibut with bait is not only easier, but often more effective than jigging, especially if you’re fishing the deeper waters where the largest concentrations of fish are usually found along this section of the Pacific coast. But contrary to what some anglers seem to think, catching halibut on bait-at least, doing it consistently down here where big flatties aren’t littering the ocean bottom-is more than just threading a hunk of meat onto a hook and lobbing it over the side. Fish the right bait, the right way, at the right time, though, and you’ll catch more than your share of these trophy bottomfish. 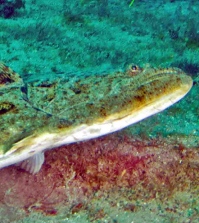 Pacific halibut get their protein from a wide variety of sources. Depending on location, time of year and size of the fish, their menu includes shrimp, most species of crab, squid, octopus, flounder, sole, sculpin, greenling, tomcod, Pacific cod, pollock, rockfish, herring, anchovy, sand lance, salmon and smaller halibut, and it’s probably safe to guess that all of these have been used successfully as halibut bait at one time or another. But some of the aforementioned critters, or parts thereof, make better baits than others, and some are certainly easier to get and/or easier to fish than the others. So, let’s look at some of the baits that catch halibut and how they can be rigged and fished most effectively. First, there are several ways to fish bait for halibut, no matter what the bait might be. I usually fish it on a wire spreader, because a spreader, at least for me, does the best job of keeping the bait from tangling in my main line. There are other popular rigs, such as the slider/parachute cord setup, but I get fewer hang-ups with spreaders, so I stick with them. The key is to keep the leader short; the nose of my bait is usually no more than about 15 inches from the swivel on the long arm of the spreader. I also use a foot-long dropper of 25- or 30-pound mono or light wire between my sinker and the spreader, so that if I do hang up, I usually lose only the cannon ball, not the entire rig. Northwest anglers catch a lot of halibut on herring, not necessarily because herring make great bait or because herring comprise the bulk of your average halibut’s diet, but because herring are readily available and they’re what most halibut anglers put on their hooks when they go halibut fishing. 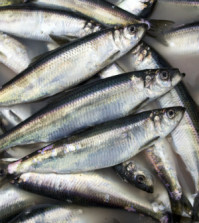 The most important thing to remember if you fish herring is that, as fish bait goes, they’re quite soft and delicate, so keeping them on the hook is the biggest challenge. The deeper you fish and the heavier tackle you need to fish those depths, the more of a problem this presents, because soft baits that keep falling off the hook result in a lot of wasted fishing time as you raise and lower your gear to check your bait or unknowingly fish bare hooks. Fresh herring are tougher and stay on the hook better than the frozen stuff, so go that route whenever possible. If all you can get are frozen herring, soak them in strong salt brine at least 12 hours to toughen them up before fishing. Use the biggest herring you can find-at least nine inches-because they’re going to show up better than the small stuff and even a little 10-pound chicken halibut will have no problem inhaling a bait that size. Most halibut angler’s fish their herring whole, and the majority use a two-hook rig similar to what we often use for salmon. I find it easier, though, to use a single hook with herring baits. My favorite halibut hook is an Owner SSW Cutting Point in either 9/0 or 10/0, and I rig it by inserting it into the center of the slit beneath the lower jaw and running it up through the snout, looping around and running it through the same hole a second time, then pulling enough leader through the snout to insert the hook into the side of the bait midway between the dorsal fin and the tail. Once the hook is seated, gently tighten the two loops of leader at the front of the bait and it’s ready to fish. 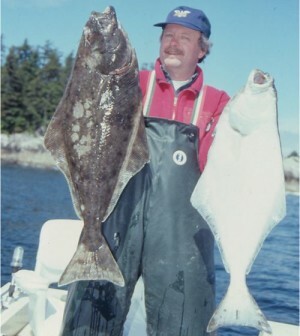 When I can find fish that are larger and/or tougher than herring, I’ll use them for halibut bait, too. The best choices are tomcod, small pollock, sole, flounder, small greenling and large shiner perch, but I’ve used a number of other species when the pickin’s were slim. If the baitfish is under about 10 inches, I’ll rig it exactly as I would a herring, using the single hook. With larger baits, I’ll usually go to the tandem-hook rig, and tie the leader on the spot so that I can match the distance between the hooks to the length of the bait. The front hook goes in just back of the tip of the lower jaw and out through the snout; the trailing hook in and out of the skin on the side of the bait, just ahead of the tail. I’ll use my 10/0 SSW hooks with baits up to about 12 inches, but will go larger with bigger baits, up to size 16/0. Before I forget to mention it, I use J-hooks for all my halibut fishing, no circle hooks. Circle hooks are fine if you have the patience to let them work the way they’re supposed to, but I’m a hook-setter, so circle hooks aren’t for me. Most of the people I’ve seen using circle hooks also seem to be hook-setters, and should be using J-hooks, but the more fish they fail to hook the better the fishing for the rest of us, so it’s fine by me. If I’m not fishing whole fish for halibut bait, I’m usually using salmon bellies. A nine- to 12-inch belly strip from a Coho is my favorite, and, like whole baitfish, I’ll use a single hook with smaller strips and tandem hooks with larger ones. If I’m single-hooking a belly strip, I’ll cut a small hole near the front end and loop the hook through twice, as I would with a whole herring, then pull the hook back and seat it in the skin side of the strip about two-thirds of the way back. Another way to use a strip of salmon belly is as a teaser a couple of feet above the main bait or even above a leadhead or metal jig. The teaser is a short length of heavy mono-I like 60-pound Berkley Big Game-with a single 7/0 to 9/0 hook at the end of it, tied to the in-line swivel connecting my braid to a heavy shock leader. Sometimes I’ll hang a six-inch plastic grub on the teaser hook, but it’s also a good place for a five- to six-inch strip of salmon belly. I always save two or three dozen pink salmon bellies for this purpose every odd-numbered year. Squid also can be an effective halibut bait. They can be fished several ways, but I either hook them fore and aft with a pair of 8/0 or 9/0 SSW’s and run them behind a spreader or run the hook of a leadhead jig through them from tip to tentacles and bounce them along the bottom like a plastic grub. If you fish squid on a leadhead, use a zip-tie or two to secure the bait high on the shank of the hook. Earlier I mentioned several other critters upon which halibut feed, including octopus, crab and shrimp, and although I’ve caught halibut with these three items in their stomachs, I’ve never caught a halibut using any of the three. Last year I pulled a 16-inch length of octopus tentacle from the throat of a 20-pound halibut I’d just boated, but later fished it until it pretty much disintegrated without even a tap. As for crab, I haven’t yet figured out a way to rig them so that they didn’t tangle and roll up in the leader. And shrimp, well, they’re just too good on the table to use as halibut bait. Although halibut are often opportunistic feeders that take what happens by within striking distance, I think you increase your odds of coaxing them into action if you offer them a bait that represents something they’re already munching on regularly. The higher percentage of their diet that particular item comprises, the more important it might be to match it. In other words, if sand lance is the entree de jour, as it probably would be early in the spring somewhere like Middle or Hein Bank, you might want to be fishing sand lance, anchovy or small herring there. I also think that the more plentiful the food supply, the more important it could be to match it, although you may not be able to determine that while you’re fishing. One way to at least get an idea is to check stomach contents of every fish you catch. One last word on bait: take good care of it. Halibut have pretty impressive appetites and at times will inhale most anything that looks like it might make a decent meal, but yellow, freezer-burnt herring or brown, mushy salmon bellies won’t appeal to them as well as fresh bait will. Halibut use their noses as well as their other senses to find food, so offer them something that smells the way it should. Fresh bait is always the best bait, and every bite of halibut bait that goes into my freezer is first vacuum-sealed.